Impeachment was intended by the Framers as a remedy of last resort, a defense from the tyranny of the British Crown, designed by its former citizens. But since its first use more than 150 years ago, impeachment has become such a normalized partisan weapon, that it has been seriously threatened against the last four presidents, and during campaigns against candidates before they are even elected. CNN’s Fareed Zakaria, host of the global public affairs program Fareed Zakaria GPS, will trace the history of why and how Article II, Section IV of the U.S. Constitution has been used, and will explore why constitutional historians feel America’s democracy may not be strong enough to withstand an exercise of this extraordinary check on presidential powers. PRESIDENTS UNDER FIRE: The History of Impeachment will premiere Sunday, Dec. 2 at 9:00pm on CNN and CNN International. The one-hour primetime special will encore Monday, Dec. 3 at 5:00am on CNN International, Friday, Dec. 14 at 10:00pm, and on Thursday, Dec. 27 at 9:00pm on CNN and CNN International. All times Eastern. Zakaria begins with a trace of the history of the Congressional impeachments of presidents Andrew Johnson, Richard Nixon, and Bill Clinton for viewers, and looks at the modern-day phenomenon that Zakaria calls ‘impeachment fever.’ U.S. Rep. Dennis Kucinich (D-OH) and U.S. Rep. Robert Wexler (D-FL) introduced articles of impeachment against President George W. Bush in 2008, former GOP vice presidential nominee Sarah Palin gathered attorneys to compile “at least 25 impeachable offenses” against President Obama in 2014, and U.S. Rep. Al Green (D-TX) introduced articles of impeachment against President Trump in 2017. None of those efforts resulted in the removal of a president from office. Exploring the arguments for and against the concept of impeachment, Zakaria debates with historians whether the current state of America’s divisive politics suggests a nation too fragile to survive an impeachment battle. Harvard Law professor Noah Feldman acknowledges that the process would be “dangerous.” Founding director of the Nixon presidential library and NYU professor Tim Naftali, PhD, agrees with this grim assessment of the state of the nation’s body politic. Naftali tells Zakaria that impeachment was never intended to be used to remove presidents whose policies were simply disliked, and moreover, America’s political polarization means its citizens now lack ‘a common baseline of facts,’ meaning they even disagree on reality. But, some experts offer compelling grounds for a possible impeachment case against Donald Trump. Also interviewed for PRESIDENTS UNDER FIRE: The History of Impeachment: Peter Baker, chief White House correspondent, The New York Times; Michael Isikoff, chief investigative correspondent, Yahoo! News; and Joshua Matz, author of the legal blog, Take Care, and co-author of To End a Presidency: The Power of Impeachment (2018). 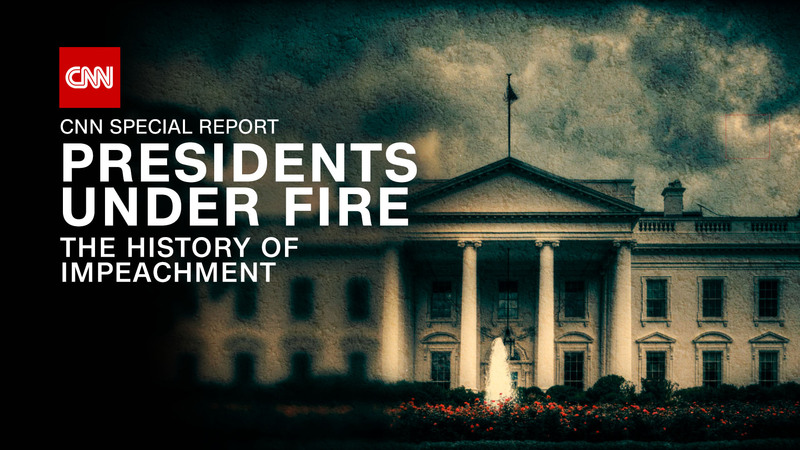 PRESIDENTS UNDER FIRE: The History of Impeachment will stream live for subscribers on Sunday, Dec. 2, via CNNgo (CNN.com/go), via CNNgo apps (Apple TV, Roku, Amazon Fire, Chromecast, Samsung Smart TV and Android TV), and on CNN mobile apps for iOS and Android. PRESIDENTS UNDER FIRE: The History of Impeachment will also be available on demand via cable and satellite systems, CNNgo platforms, and CNN mobile apps, beginning Monday, Dec. 3.